The wonderful thing about building our own home, has been the opportunity to start from scratch with the interior decorating. Achieving the pared-back Scandi style I'd dreamt of for so long, has been a dream come true. Of course, you don't need to start from scratch to achieve a similar look, and in fact combining vintage pieces with some fresh, affordable finds can produce a really fun, eclectic result. I know that the term eclectic can bring about visions of clashing styles and clutter, however I like to think of it as simply mixing the old with the new, and ultimately creating a home with soul. 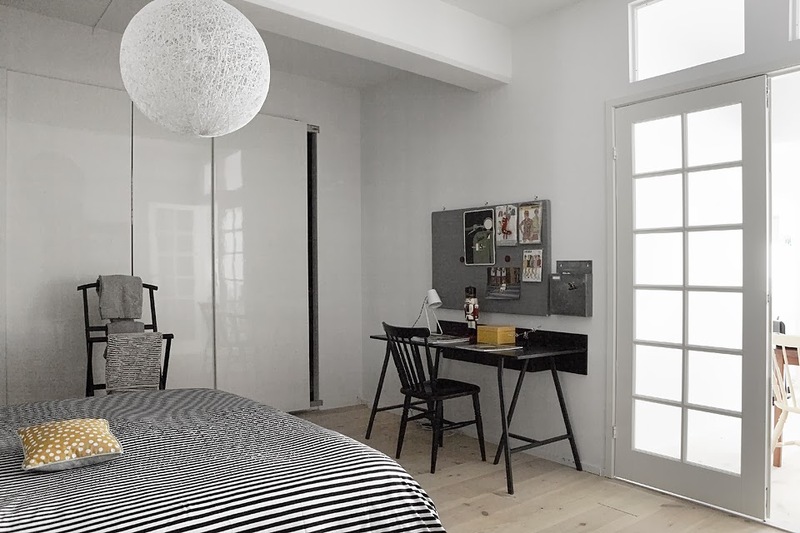 Just this morning, while checking into some of my favourite Swedish real estate sites, I came across a great example. A new listing on Fantastic Frank, this home features a laid back eclectic style, without being too 'fussy'. If you're renovating an older home, ripping up carpet to reveal natural wooden flooring and painting the interior white can work wonders. 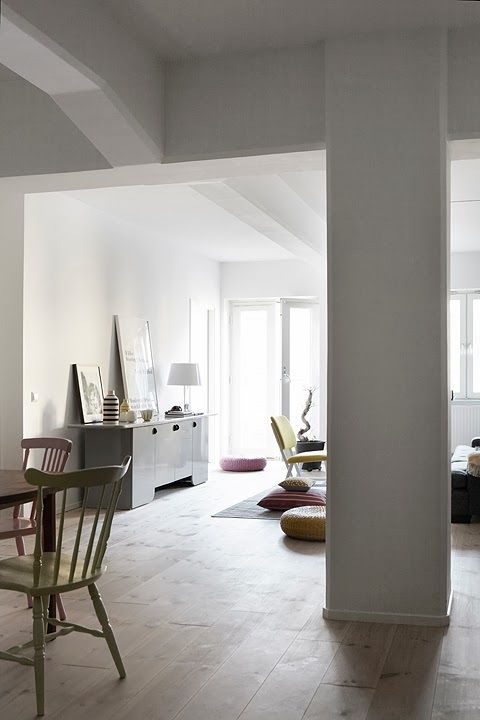 Minimal styling allows the original details of an older home to shine through. In this case the high ceilings, beams and French style doors. It looks like the owners have sourced some great second-hand pieces of furniture, such as the dining table and chairs, which have been painted in different colours. 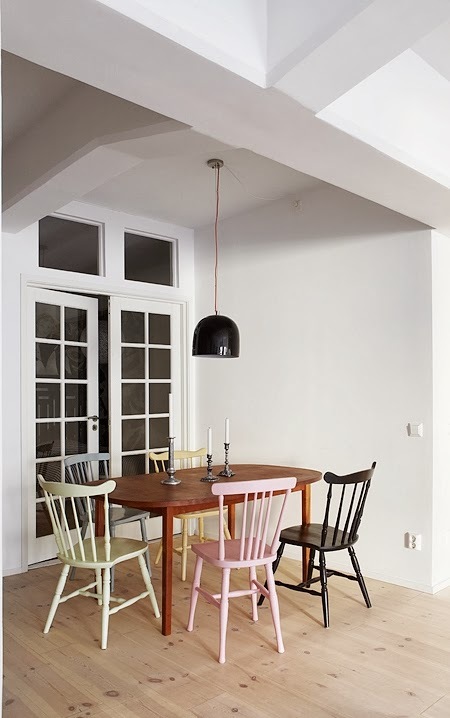 The simple black pendant light creates the perfect finishing touch. Adding to the fun, relaxed style of the light filled, open plan apartment are the colourful accents, floor cushions and picture wall. 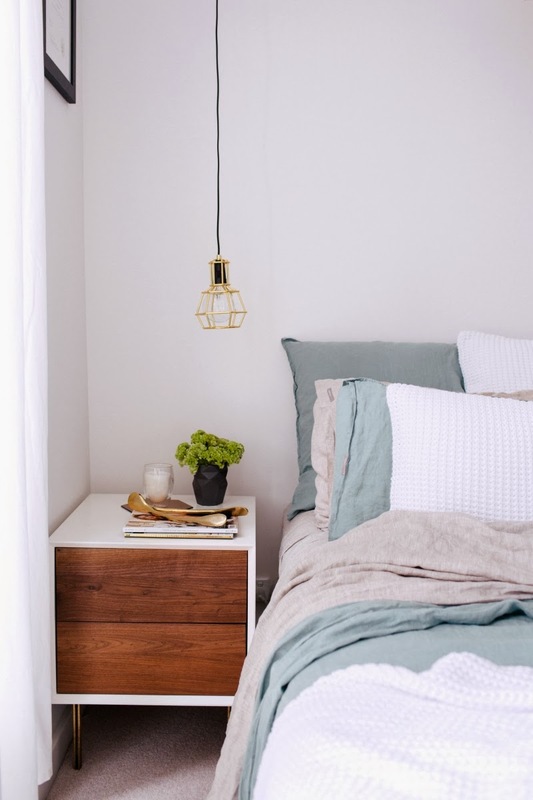 The striped bedding, and simple workspace make the bedroom a standout for me. I love the black trestle table and felt memo board. See the full house tour here. The latest issue of Adore Home, the budget edition, features another great example of how to achieve a simple, Scandi style without breaking the bank. This time in a modern home. The owner of the lovely new Sydney apartment, Trista Wilks is actually a bank manager, so she knows a thing or two about money and how to save it! To see how Trista has cleverly mixed vintage pieces with gorgeous new buys, check out the latest issue, for free! In addition to more lovely homes and interior inspiration, there is a fantastic section on budget buys. 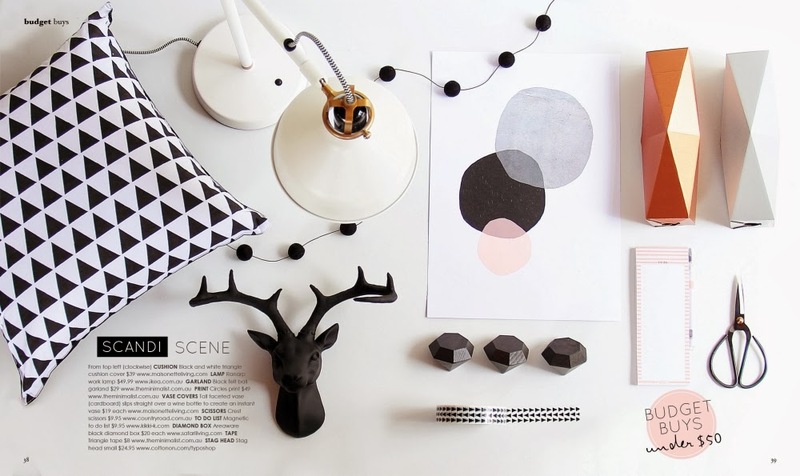 The Scandi Scene featuring buys under $50, is a must read! I love the way the flooring looks! I am about to become a home owner as soon as my meeting with my mortgage company (Avrus Mortgage) closes next week so I have been looking up cheap design ideas. I have a low budget but I need to make this house look more like home. 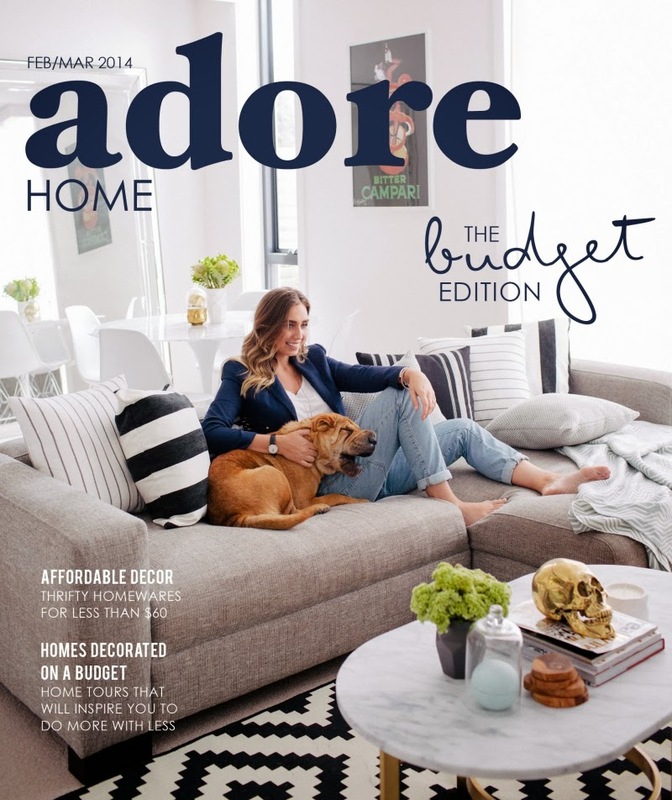 I will have to check out Adore Home Magazine. Thanks so much for sharing Michelle. 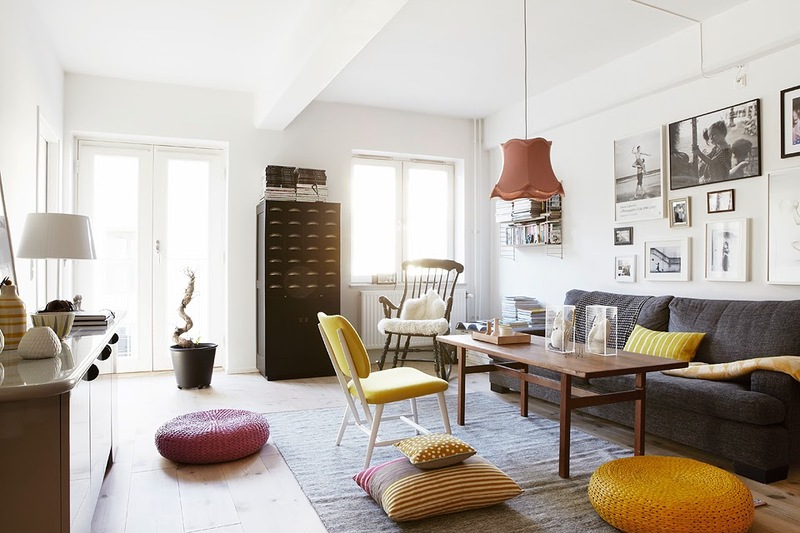 Of course I love this style because I'm Nordic myself :) Great post!